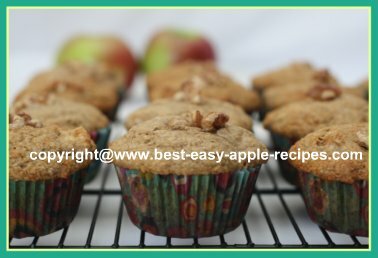 I made these Healthy Apple Muffins today, and they are fantastic in texture, and in flavour. Very moist, with lots of apple in every bite! 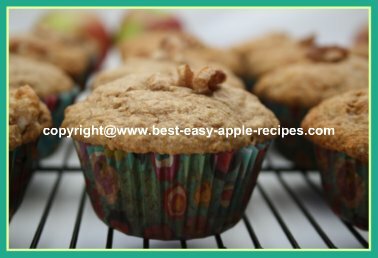 I used walnuts, however if you choose to use different chopped nuts, that will work equally well for this apple muffin recipe. Or, you can choose to leave out the nuts completely. 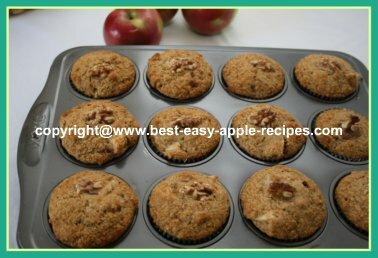 A definite healthy, wholesome muffin! In a large bowl, combine the all-purpose flour, whole-wheat flour, oat bran, baking powder, baking soda, cinnamon, walnuts and apple pieces, and mix with a fork to combine. In another bowl, mix the brown sugar and buttermilk together to combine. Add the egg whites, and continue to beat gently with a fork, until well blended. Add the egg mixture to the dry mixture, stirring with a wooden spoon, just until blended Do NOT over mix. Spoon the batter into a greased or paper lined muffin tin, filling cups to the top. Bake at 400° F for about 15 minutes, or until golden. 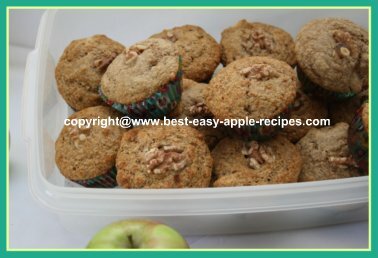 Makes about 15 medium-large delicious apple muffins! When making muffins, it is important not to over mix the batter because this will cause the muffins to be tough with a too compact texture. The ingredients should just be moistened and the mixture lumpy, even with a few traces of flour.